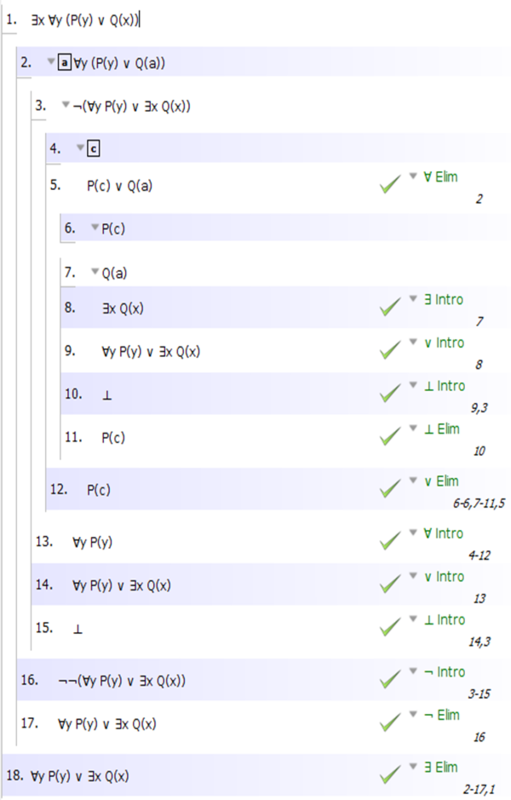 I need to complete the following proof using only primitive rules (the introduction and elimination rules for each connective and quantifier). 6|   |   | ??? | ??? I can't figure out how to split the disjunction into its respective parts using only primitive rules. You cannot that way; after step 3), you need ∨-Elimination (i.e. Proof by Caes). You have to start two subproofs: one from assumption Pc and the second one from Qa and in both cases derive (∀y)Py ∨ (∃x)Qx. Not the answer you're looking for? Browse other questions tagged logic proof deduction symbolic-logic or ask your own question.